♥ What I like to call “Bendy Pizza”. Basically a slice so cheesy & gooey, it bends in half easily. The crust has to be super thin too! ♥ Having a super close family. Being the oldest of 4 girls is seriously so fun too! Love this post and hearing more of what YOU love! Your hubby is so sweet to ask you that each day! 🙂 Happy Valentine’s Day! Wow for the Post Man to say something you know that it’s true! I am so excited for Rosanne! Happy Valentine’s Day Week! Beautiful post. So cute and so much love to celebrate. YOU are LOVE!!! 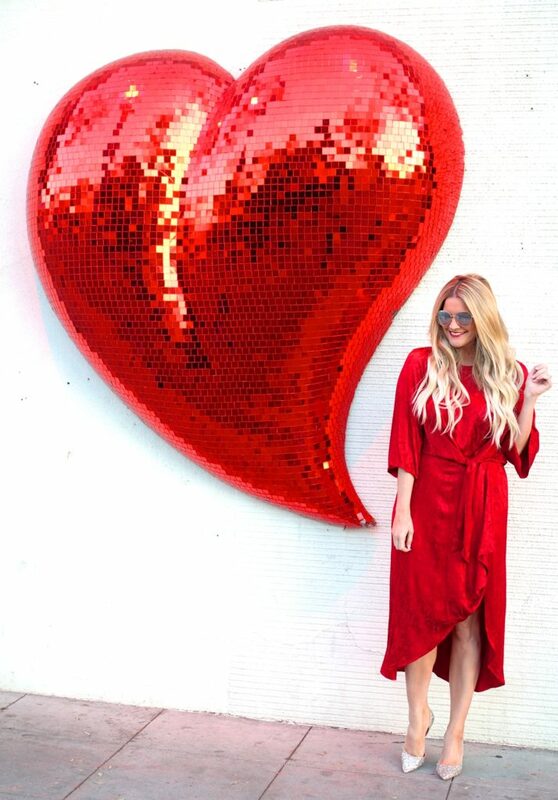 Beautiful girl, not only is this red so you and so stunning, I adore reading what makes your heart happy! I am so excited Roseanne is coming back too and that hubby of yours is a keeper! Mine calls me beautiful everyday and it makes me melt every time..still!! LOVE YOU!! This post brought such a smile to my face. It’s so refreshing seeing a positive Valentine’s Day post for a change. Too many people poo-poo this holiday. What’s so wrong with a holiday celebrating love? We all need a little more love in our lives! You can never have too much love. Omg, that is the BEST backdrop ever! So cute! And you look fantastic standing next to it! Loved reading your 14 random things. I can’t believe you’ve never used a blog title twice, amazing. Have a great Valentine’s Day! This is so fun! I love your list and all the special things. I didn’t know you were the oldest of four girls. This dress and photo spot could not be more perfect!! These photos are amazing, and your dress is gorgeous. Tomorrow you will learn 14 things I love too! Cute photos for valentines day. I love the giant heart. Yea to close families, being oldest and bendy pizza! 🙂 But I’m probably crushing most on your blogpost spreadsheet! This is so so cute, Shauna! 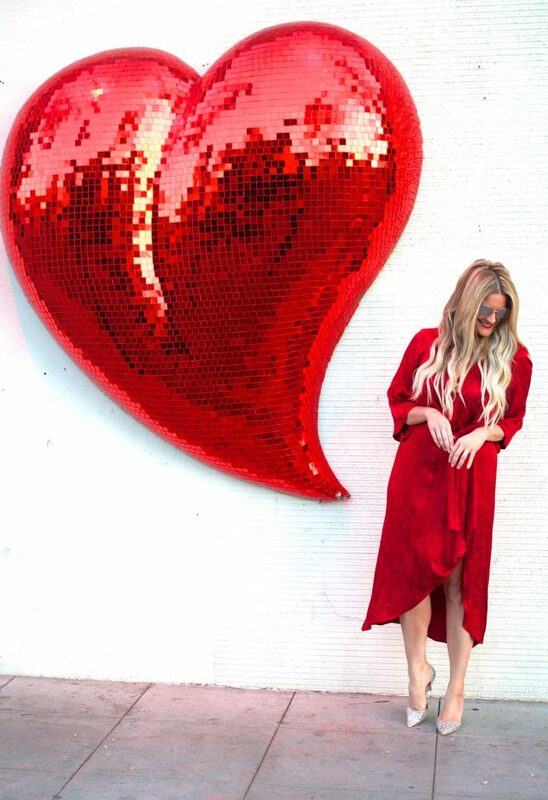 I mean, how perfect is that heart wall?! So perfect with your red dress — I love the front tie! Hope you guys have a wonderful Valentine’s Day and enjoy your pizza! Happy Monday! This is such a cute photoshoot. I LOVED seeing it on insta. I totally think it’s the cutest shoot for the Valentines Day theme. Omg, this shoot- SO FUN. You look amazing in red! And I’m with on the pizza- please give me ALL the cheese! Love your post and reading about things that you love. Your red dress is gorgeous and love the backdrop! How perfect are these photos?!! Love that gorgeous dress! Happy Valentine’s Day! Aww I love this list! So cute. Amazing wall, too! Such a great post babe!! Love your dress!! Hope you are having a great week so far! It’s so hot here, another heatwave! This post is seriously the cutest! Red is DEFINITELY your color! Gorgeous! Happy Valentine’s Day! I am right there with you on loving the house decked out in Christmas lights & these photos are just darling!! Hope you have a great holiday! Such a pretty outfit for Valentine’s day !! Love reading your post, so much of happy and fun and vibrant vibes. You look beautiful in red dress <3 Hope you had a fab V day. These photos turned out so cute!! I love that dress on you, so stunning! You look sooo adorable dear! Love your red dress, and your shining and sparkling heels are simply gorgeous! Love your list! yes to puppy cuddles, ice cream and faux fur! Love your dress, so pretty! I think every girl needs a red dress, and you know i love Zara!